In the Taskforce team we are continually trying to boost recognition of the valuable role that libraries do, or can, play in helping deliver against the wider priorities of government (or other organisations which are important to the sector). We often work with other officials to get libraries mentioned in the drafts of various strategy documents - which is an important first step. And we also try to get them to feature some kind of case study, to give an example of, and bring to life, what this means around the country. However, when these documents go out for wider consultation it’s incredibly important that library services or individuals respond - both to reinforce what we’ve been saying, and also to provide further examples of the great work that public libraries are doing all over the country. The more examples a team receives, the more likelihood that the contribution of libraries to a particular strategy will be recognised and confirmed - and acknowledged in the final version. There are a number of consultations or opportunities to influence these strategies and make your views count going on at the moment. If you haven’t already, then please do have a look at them; and give your views, and examples of great work you’re doing, to the people who are running them. This is the most pressing one to look at, since the first phase of this consultation closes on 11 April (and to take part you need to register and get approved by an administrator which might add to the time it takes to get involved). Arts Council England wants to make sure arts, museums and libraries in England are thriving for the next decade, and it wants your thoughts about how best they can do that. It’s developing its 10 year strategy (to run from 2020 to 2030) and is aiming to have an open conversation with anyone that has a stake in or an opinion on the future of arts and culture in England via its on-line platform. Based on this it will draw up a draft of the strategic framework and will hold a full sector consultation on this during autumn 2018. So if you miss this opportunity to input your views, watch out for the next one! Finally, based on feedback from the consultation, the full strategy and framework will be published in 2019, to take effect from 2020. 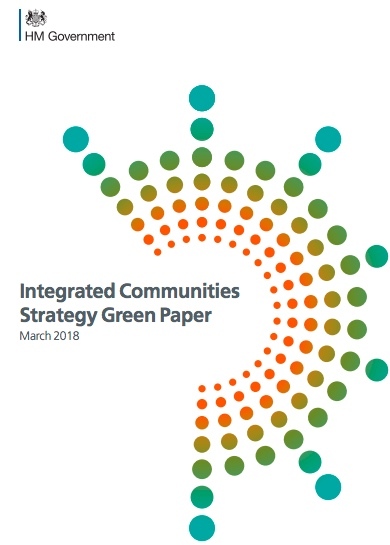 The Integrated Communities Strategy green paper, published on 14 March, invites views on the government’s vision for building strong integrated communities where people – whatever their background – live, work, learn and socialise together, based on shared rights, responsibilities and opportunities. It includes recognition of the role that public libraries play in helping to bring diverse groups of people together in many different ways. A few weeks ago we published a blog post giving more background on this. The Ministry of Housing, Communities and Local Government wants to hear from individuals, communities and organisations about the most effective ways to address integration challenges, and this page sets out a number of different ways in which you can share your views. There is an online survey or a form, or you can email the team directly. So please make sure you respond - this is a good chance to let them know about the successful work your library service is doing on this sort of issue! This consultation closes on 5 June. The Office for Civil Society (OCS) is developing a strategy to help shape its work with and for civil society over the next ten years and beyond. This is intended to support policy across government, in its efforts to tackle loneliness, build integrated communities and drive social mobility. This covers a wide range of activities; from acts of generosity and kindness by individuals, to community-led activities and the vital work of charities and social enterprises, in partnership with central and local government. OCS want to start by hearing a wide range of ideas: what needs to change to make this possible and what government’s role in enabling this should be. Whether you are part of civil society or see it as part of your mission to help create a stronger civil society, it wants to hear from you. This page gives more information on this, along with a link to give your views, and provide examples of good practice. This opportunity to comment closes on 22 May. Key and basic to the Libraries Task Force aim MUST be first and foremost to protect Library services. So what are your plans to prevent the closure of the vast majority of Northamptonshire Libraries? In NW Northamptonshire we will have two towns with combined population of 19,000 (plus surrounding villages) and no Library later in 2018. What will you do to save our Libraries? As Kathy Settle mentioned in her previous blog, the Taskforce as a collective body cannot cut across the statutory role of the DCMS Secretary of State, whose responsibility it is to superintend the delivery of library services under the 1964 Public Libraries and Museums Act. The Taskforce’s Terms of Reference do not allow for it to become involved in determining the rights and wrongs of individual cases. However the Taskforce will continue to support and challenge councils to learn from, and adopt, the good practice guidance we’ve produced. I feel very strongly about keeping our libraries open they are not only there for the lending of books but also a life line for many lonely and vulnerable people the young mothers who don't know anyone it's there way of making new friends in a similar situation. the elderly who need advice. Young people who need help with cv .we must keep these valuable places. Many of our services we should be proud of in GB are our free libraries, adding to the communities up to date facilities hence moving with the times and enhancing education and stimulation to all ages. Please please please keep our jewels in the crown of Great Britain!!! Once lost are gone for ever. If County Councils are unable to manage their libraries then I would like to see another support system in place that ALL the community run libraries can join. A not for profit organisation supported by government that would enable a high standard of library provision all over the country. The Libraries Taskforce, the Society of Chief Librarians and Locality all provide support to a Community Managed Libraries Network which is funded by Power to Change. This is a peer network which promotes and provides training, information and networking opportunities for community managed libraries. Anyone interested can sign up via their blog.